We covered generating your Jilt DNS records along with some general guidelines in our article Can I send emails from my own domain? 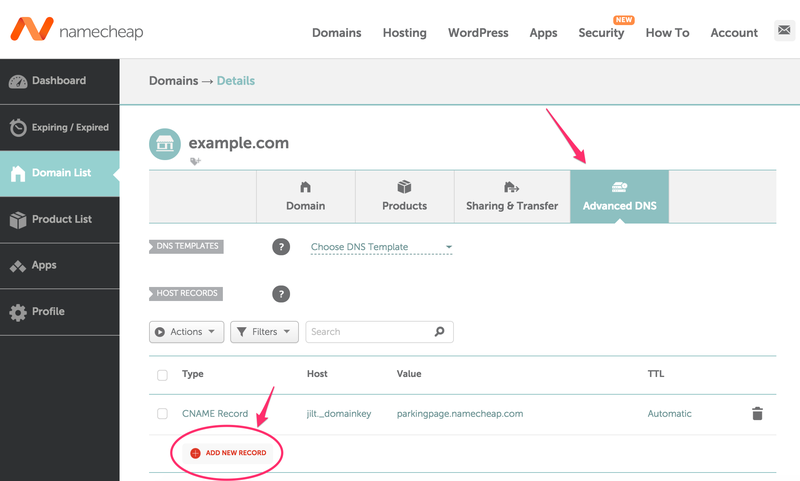 Here we'll take a look at adding the SPF and DKIM records to your Namecheap domain host. 1. Log in to your Namecheap account and choose Domain List. Click the Manage button next to the domain you're using with Jilt. From here we'll go to the Advanced DNS tab and then click the Add New Record button. 2. Select CNAME Record from the Type field. 3. Copy the Host value generated by Jilt. Back in Namecheap, enter this value in the Host field. Now do the same thing for the value field as well. 4. We'll leave the TTL (Time to Live) field as the default. With everything set, we're ready to click the green checkmark to add the record. Once the DNS has had a chance to propagate (sometimes up to 48 hours), return to Jilt's Email Domain page to complete verification.